A Parenting Plan is required in all cases involving time-sharing with minor children, even when time-sharing is not in dispute. This legally establishes the conditions and circumstances for time sharing, and can also establish custody, visitation, and decision making authority regarding the children as it pertains to time sharing and living arrangements. 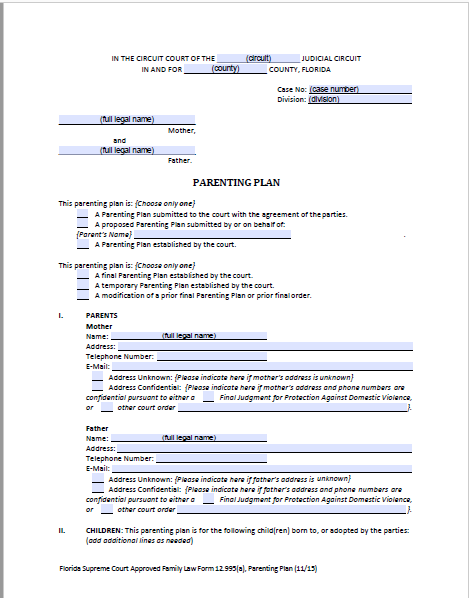 This shared parenting plan form or a similar form should be used in the development of a Parenting Plan. If the case involves supervised time-sharing, the Supervised/Safety Focused Parenting Plan, Florida Supreme Court Approved Family Law Form 12.995(b) or a similar form should be used. This shared parenting plan form should be typed or printed in black ink. If an agreement has been reached, both parties must sign the shared Parenting Plan and have their signatures witnessed by a notary public or deputy clerk. After completing this shared parenting plan form , you should file the original with the clerk of the circuit court in the county where the petition was filed and keep a copy for your records. You should then refer to the instructions for your petition, answer, or answer and counterpetition concerning the procedures for setting a hearing or trial (final hearing). If an agreed shared Parenting Plan is not filed by the parties, the Court will establish a Plan. For further information, see chapter 61, Florida Statutes, and the instructions for the petition and/or answer that were filed in this case. 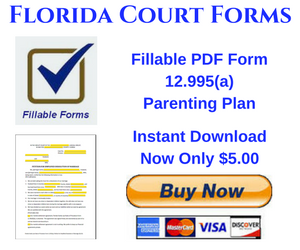 The Twelfth Judicial Circuit has an excellent on-line page about Florida Parenting Plans. Highly recommended. The methods and technologies that the parents will use to communicate with the children. The best interests of the children is the primary consideration in the Shared Parenting Plan. In creating the Parenting Plan, all circumstances between the parties, including the parties’ historic relationship, domestic violence, and other factors must be taken into consideration. The developmental stages and needs of the child(ren) and the demonstrated capacity and disposition of each parent to meet the children’s developmental needs. This standard shared parenting plan form does not include every possible issue that may be relevant to the facts of your case. The shared Parenting Plan should be as detailed as possible to address the time-sharing schedule. Additional provisions should be added to address all of the relevant factors. The parties should give special consideration to the age and needs of each child. In developing the shared Parenting Plan, you may wish to consult or review other materials which are available at your local library, law library or through national and state family organizations.